(Onitsha Nigeria, 1st day of May, 2013)-January to April 2013 remain the darkest periods in the history of Nigeria outside the full blown war and violence such as the 2011 post election violence in nine northern Nigerian States and the 2009 military action against the Boko Haram violent Islamist insurgents and the latter's retaliated killings in some northern parts of Nigeria as well as the Jos killings of 2001 and 2007. An investigative finding by the leadership of International Society for Civil Liberties& the Rule of Law shows that over 1000 citizens were murdered in Nigeria between January 1 and April 30, 2013. Their killings were traced to the doorsteps of both lawfully and unlawfully armed malicious elements within and outside the country's security forces including the malicious personnel of the Nigeria Police Force, Joint Military Task Forces, Multi-national Joint Task Force, militant ethno-religious zealots such as Boko Haram/Ansaru armed Islamists/ malicious elements at the center of Jos killings and other criminal elements such as deadly politicians and resurged armed Niger Delta militants. The citizen-victims of these killings include serving members of the Nigerian security forces, militant elements within the Boko Haram and the Ansaru Islamist movements, civil politics practitioners, crime suspects and innocent detainees who were non-violently taken into police custodies, but later killed extra-judicially. The over 1000 murder casualty figures will be grossly under-calculated if the unreported cases arising from vigilante killings across the country, police pretrial killings, secret killings by armed Islamist and ethnic groups operating in North-central, North-east and North-west zones of Nigeria, resurged Niger Delta militants as well as killings arising from armed robbery, kidnapping, ritual deaths, civil homicides and road accidents, are added. If attempts are made to capture all these, then it may most likely be correct to estimate them in the neighborhood of over 4000 murdered deaths since January 2013. For instance, in the past one year in Lagos State, Southwest Nigeria, it was officially reported by the State Police Command that a total of 270 civilians and 32 police personnel were murdered during the violent criminals' onslaughts in the State. Similarly, in four months, that is to say between January and April 2013, over 300 Nigerian citizens were killed in road accidents across the country. For instance, on 27th day of January, 2013, 22 citizens died at Nkpor, near Onitsha, Anambra State, Southeast, Nigeria in a fatal road accident. The number of those who died on the spot was 18, three later died bringing the total casualty figures to 22. On about 27th day of March, 2013, 18 citizens perished along Lokoja-Abuja Federal Road, in Kogi State, North-central Nigeria. On 5th day of April, 2013, media reports had it that 80 citizens and 36 citizens respectively were killed along Benin-Lagos Dual Carriage Way in Ugbogu area, near Ofosu in Ovia South-west LGA of Edo State, South-south Nigeria and Ihiala in Ihiala LGA of Anambra State, Southeast Nigeria. On 26th day of April, 2013, seven citizens were killed at UNIZIK junction in Awka, Anambra State. The five fatal road accidents under reference resulted in the death of a total of 163 citizens. More of such fatal accidents that occurred since January 2013 are not captured in this public statement. The ethnic and gender identities of the said accident victims show that 95% of them are from the Igbo-Southeast Nigeria, while 70% are adult-males, mostly at their prime stages of life. The major cause of most of the said accidents is traced to the recklessness of the drivers of the trailer trucks involved, driven by young Nigerian citizens of Hausa-Fulani extraction. Some concerned citizens have described them as Boko Haram Trailer Drivers, because of reckless abandon with which they kill Igbo-Nigerian travelers in droves on Nigerian roads. In Anambra State alone, more than five trailer trucks manned by young Hausa-Fulani drivers have been reported with high casualty figures since January 2013. The figures pertaining to the over 1000 citizen-deaths since January 2013 are arrived at by our leadership from de-classified Nigerian security forces' sources and open sources such as on-the-spot findings, eyewitnesses' accounts and media reports. In the Boko Haram associated violence, at least 602 citizens were murdered between January and April 2013. In other ethno-religious violence such as Jos violence, over 200 citizens were murdered in the four months under review and in the area of police pretrial killings and associated others; at least 200 citizens were murdered in various police custodies across the country between January and April 2013. 1. Boko Haram Violence: Some of the Boko Haram violence associated killings since January 2013 are the following: On 23rdday of January, 2013, it was reported that 12 residents of Jiddari-Polo and Laddan Ciki areas of Maiduguri in Borno State, Northeast Nigeria were murdered by Boko Haram Islamist insurgents. The deaths included one Alhaji Zakka, a director in the State Ministry of Animal & Fisheries. 2. On 22ndday of February, 2013, five citizens' playing card-games in Angwan Bagadaza area of Gombe State, Northeast Nigeria were reportedly shot dead by Boko Haram insurgents. 3. On 20th day of February, 2013, three persons died in bomb explosions reportedly detonated by Boko Haram insurgents at the Post Office Roundabout in Maiduguri, Borno State. 4. On 23rd day of February, 2013, several people were reportedly killed in clashes between Nigerian security forces and suspected Boko Haram insurgents in Maiduguri, Borno State. 5. On 3rd day of March, 2013, the JTF spokesman, Lt. Col. Sagir Musa said it killed 20 Boko Haram insurgents during the terror attacks the group launched at security barracks in Monguno area of Borno State. 6. On 8thday of March, 2013, the JTF through Lt. Col. Sagir Musa said it killed 52 Boko Haram insurgents during its special operations in Bulabulin, Bayern Quarters and Jajeri area of Maiduguri, Borno State. 7. On 18th day of March, 2013, between 180 and 200 people or more, mostly Nigerian citizens of Igbo extraction were massacred at the New Road Luxury Bus terminal in Sabon Gari area of Kano State, Northwest Nigeria during multiple bomb explosions detonated by Boko Haram insurgents. Nigerian authorities, as expected, claimed that only 22 people were killed in the bombings. 8. On 16th and 17thday of April, 2013, 228 people including women, children and elderly were massacred during violent clashes between the Multi-national Joint Taskforce led by the Nigerian military and the Boko Haram insurgents in the fishery and border town of Baga in Kukawa LGA of Borno State. The Nigerian security forces went on killing and property destruction rampage in retaliation for the killing of a soldier by the insurgents. While the Nigerian security forces mangled the casualty figures down to 36/37; claiming that 30 Boko Haram insurgents and six civilians were killed, the local officials said they buried 185 bodies. Days after the massacre, the Senator representing Borno North in the Senate visited the area on a two-day fact finding on 25th and 26th day of April, 2013 and reported that he counted 228 bodies from Makabartar Waya graveyard-130 bodies, Makabartar Arewa graveyards-60 bodies and Budumari graveyard-30 bodies. Senator Maina Maaji Lawan, who is a former governor of the State, also reported that six other dead bodies were buried inside town and that up to 4000 houses (thatched homes) were torched. Similarly, the satellite imagery obtained and analyzed by the US based Human Rights Watch, which contained in its public statement of 1stday of May, 2013 confirmed that a total of 2,275 houses mostly residential houses, were destroyed by soldiers in Baga, while 125 were damaged. In the latest public statement, dated 30th day of April, 2013, signed by one Dr. Reuben Abati, on behalf of Nigeria's President, the government's mangled casualty figure of 36 bodies was retained. The statement further said that houses/properties destroyed were far less than 1000. The Nigerian military had earlier claimed that 30 houses were destroyed in the offensive operations. For us in the Intersociety, Senator Maina's casualty accounts and the HRW's property destruction accounts are acceptable to us until credibly disproved. On 25th day of April, 2013, 25 people including five police personnel were reportedly killed during clashes between Nigerian security forces and Boko Haram insurgents in Gashua area in Bade LGA of Yobe State. 9. On 25thday of April, 2013, Saharareports reported that a serving Divisional Police Officer and several other police personnel were killed during Boko Haram attacks that hit Bama area of Borno State and on 28th day of April, 2013, a JTF official, Lt. Col. A.G. Lakka confirmed the death of 17 people including seven police personnel and ten insurgents in the clashes. 10. On 27thday of April, 2013, 25 people were reportedly killed during clashes between Nigerian security forces and Boko Haram insurgents, when the latter attacked a police station and a bank in northeastern area of Yobe State. 11. On 28thday of April, 2013, five people including three police personnel were reported killed in Ringim area of Jigawa State, Northeast Nigeria during Boko Haram attacks at a police station and a bank. The statistics above cited shows that a total of 602 Nigerian citizens, comprising fewer security personnel and armed Islamist insurgents and other innocent civilians including women, children and elderly have been murdered since January 2013 in Boko Haram associated violence in northern parts of Nigeria. There may most likely be some reported Boko Haram killings within the period under reference that are not captured in this public statement. Some of the killings also go unreported. Government's casualty figures are usually mangled. Jos Killings: 1.On 25th day of January, 2013, the Nigerian military sources reported the death of 10 people in Wadata area of Wase LGA of Plateau State. Local independent sources later said they found 22 bodies after the attacks launched by the Fulani Muslim invaders against their Tarok Christian host. 2. On 22nd day of February, 2013, 10 people were reported killed in Kogwom village in Vom district, Jos South LGA of Plateau State in similar attacks. 3. On 27th day of March, 2013, 28 people were reported killed in Ganawuri district of Riyon LGA of Plateau State and less than seven days earlier, 10 people were reported killed in Mavo village in Wase LGA of Plateau State. 4. On 29th day of March, 2013, nine people were reported killed in Ratas village of Fan district in Barkin Ladi LGA of Plateau State. 5. An official report from the North-central zone of the National Emergency Management Agency in April 2013 reported that a total of 113 people were killed in Wase and Bokkos areas of Plateau State alone in March 2013. According to media reports which quoted its zonal coordinator, one Abdulsalam Mohammed, 71 people were killed in Wase in the March 19, 2013 bloody clashes between the militant Fulani invaders and the host communities, while 42 people were killed on March 29, 2013 in similar bloody attacks. The killings above cited show that a total of 192 people have been murdered in Plateau State since January, 2013. Again, not all reported killings in Plateau State within the period under review are captured in this public statement. Some of these killings also go unreported, while casualty figures from official quarters are usually mangled. 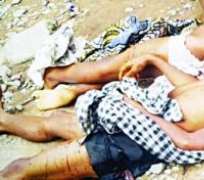 Police Pretrial Murders: On 19thday of January, 2013, up to 50 murdered bodies or more were found dumped and floating on Ezu River, in Amansea, Awka, Anambra State, Southeast Nigeria. Credible findings by local and international reputable rights organizations have continued to show that they were crime suspects and other detainees arrested and taken into custody by the Special Anti Robbery Squad attached to Anambra State Police Command, which is headquartered at Awkuzu, Anambra State. They were strongly believed to have been arrested non-violently between October and December 2012 and killed extra-judicially by SARS. Specifically, nine members of the non-violent MASSOB movement, who were arrested on December 7, 2012 and taken into the SARS custody at Awkuzu have disappeared till date. They are strongly believed to be among the 50 murdered bodies found in Ezu River on 19th day of January, 2013. In early March, 2013, it was reported in the media and confirmed by local village authorities that 10 murdered bodies in various stages of decomposition, were found dumped at a burrow pit in Mgbirichi Community of Ohaji Egbema LGA, Imo State, Southeast Nigeria. The 10 murdered bodies are believed to be victims of extra-judicial killings by security forces in Imo State since there was no report of inter or intra communal violence in the area. At least, 200 Nigerian citizens including the over 60 citizens cited above, must have been killed in police custodies in Nigeria since January 2013. The murdered citizens must have died from torture or outright custody killings. In most, if not all the 6,651 police field formations in Nigeria, torture and pretrial killings are common features of extracting confessional statements or criminal enrichment. Among SARS operatives especially in Anambra State, torture and pretrial killings are still raging like wild fires. Anambra SARS operatives have become deadlier since their atrocious acts of 19th January, 2013, which the NPF High Command and the Presidency seemed to have condoned with impunity. The murder of Citizen Obinna Okoye-a student of OKOPOLY, by the Ekwulobia SARS unit in Aguata LGA of Anambra State, is one out of many of such atrocious killings still ongoing. He was arrested in January 2013 over an alleged motorbike theft and tortured to death in the second week of February 2013, after his father was asked to fetch the sum of N300.000 for his son's freedom and life. Conclusion:It is very clear that Nigeria has become a theatre of death especially since January 2013. The gross weakness of the Government of Nigeria has continued to embolden killer-malicious elements and encourage militancy in Nigerian society. Our decision to retain the over 1000 casualty figures is to let the world have an idea of the valueless nature of human lives in Nigeria. If outside the law is strictly applied here, then the number of those killed in the country since January 2013 may most likely be in the neighborhood of 4000. This is because Nigerian citizens are killed outside the lawacross the country on daily basis. From the 6th day of April, 2013 murder of 15 Nigeria police personnel by MEND on the creek of Ijaw South LGA of Bayelsa State to early March 2013 gruesome murder of Commissioner of Police Chijioke Asiadu in Enugu, Enugu State; the list is inexhaustible. Nigerian security challenges are threatening because the Presidency allows them and uses them to merchandize-a sort of trading on citizens' lives. Solutions to these challenges are not insurmountable. Strong political will including being open to constructive criticisms and acceptance of noble ideas are steadily required of Nigerian political authorities. Also required are intelligence and preventive based policing as well as effective and technologically advanced criminal investigation and litigation management. Gun-culture or AK-47 security approach is no longer in vogue in world security and crime management. The Baga military blunder is one of such instances and the height of unprofessionalism and primitive gun- culture approach. These are the trade-marks of rogue States and undemocratic regimes. One of the strongest external solutions to Nigeria's killing fields remains the invitation or intervention of the office of the Chief Prosecutor for the International Criminal Court. This is because none of the citizens' killers in Nigeria would wish to be humiliated locally and internationally before being handcuffed to the Netherlands to face trials for crimes against humanity or war crimes.